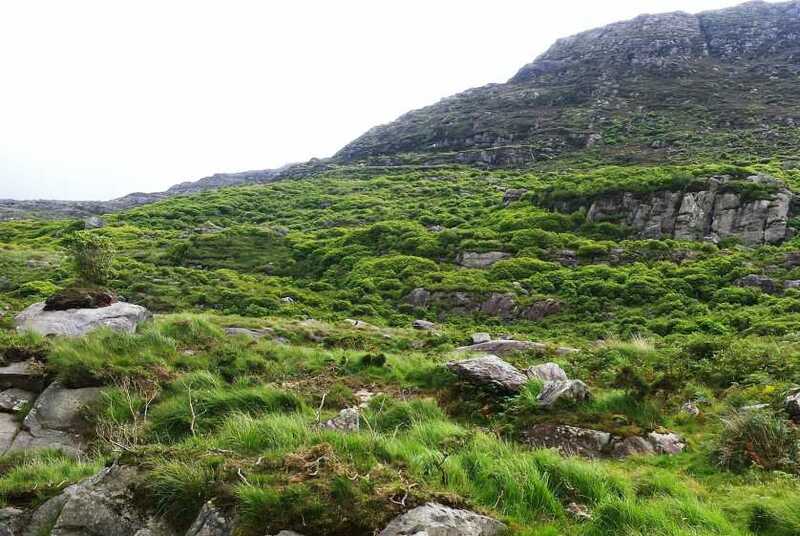 Mothaillín is the 549th highest place in Ireland. Mothaillín is the second most northerly summit in the Dunkerron Mountains area. I had decided to go up Mothaillin from the north as part of a longer route. Map study indicated that any approach across Eskwacruttia was likely to be on steep rocky ground, and therefore my plan was to leave the road circa V8478781612 E and head east for Derrygarriv somewhere around V8588581547 F. I would then head straight to the summit across gentle slopes before continuing to Stumpa along the gradually rising ridge. Unfortunately, all my preparations went out the window as I made my way east along the road south of Cummeenduff Lake in the pre dawn gloom. I could see the the faint silhouette of the mountain and the gobdaw in me couldn't resist taking a "short cut" by leaving the road at about V8426081440 G and ascending towards V8460080590 H. The idea was to get up there, descend into the col and reach Mothaillin. It would be easy, I thought. Take a look at the picture I have uploaded. Even in daylight you may feel that the furry green foliage is mere grass surrounding the easily avoided rock buttresses. Wrong! The green stuff is made up of the most dense rhododendron foliage known to man. I fought my way through this jungle with the greatest of difficulty. To make matters worse, I was soaked to the skin by the wet leaves even though the sky was clear. In places I had to crawl on my hands and knees. Getting up little rock buttress was a nightmare. The result:by the time I reached the small prominence by the col to Mothaillin, I was exhausted. I try to organise routes that permit a gentle start to a day's walking. This allows the body to adjust to the exercise, and develop rythym. I cannot emphasise enough how debilitating my crazy ascent proved to be. It meant that I was forced to abandon part of my planned subsequent route for the day several hours later. It was a high price to pay for my impatience to begin the ascent of Mothaillin.